It seems like it was only yesterday when Galaxy S8 arrived. But it’s great to know that S9 is soon going to be there. Samsung has proved itself over the years and raised the bar for all, the Infinity Display and all-glass design of the S8 was a great success. There aren’t any official pictures available for the device but rumors say latest phone would be like S8 and there is nothing wrong in that. Samsung won’t be making much changes to the 18:9, slim-bezel design used in Galaxy S8 and S8+. S9 will have the same display the reason for same can be found in some tweets posted. This time “Galaxy S” is focusing more on performance enhancements rather than on physical changes. But some reports suggest there will be alterations done to the top and bottom bezels to make it look different. However, the back of the device will be modified as users did not like the way fingerprint sensor was placed in S8. There are rumors that Samsung might make changes to the sensor position in S9. They might move it below to the camera. Apart from regular black, gold, and blue variants there will be a new deep-violet option. Recently shown by Qualcomm, it is said that Snapdragon 845 chip the successor of 835 chip is made for S9. 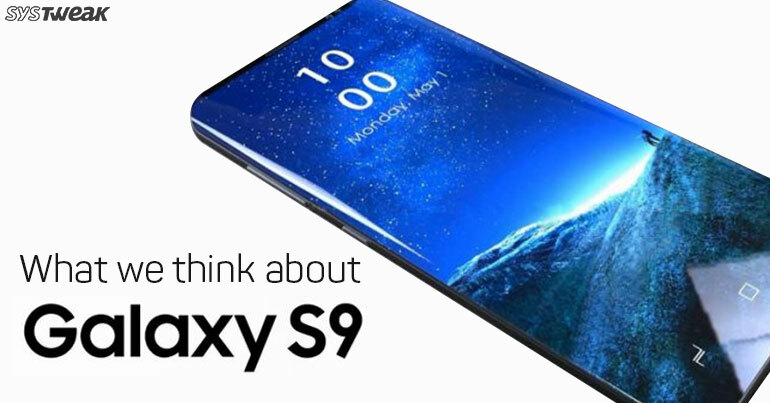 Same as the other chips this one too will be co-designed and manufactured by Samsung, meaning S9 will be a fashionable launch phone. The new 845 chip includes an AI chip that will boost the speed and power efficiency of the device and Samsung’s Bixby assistant. Not only this the chip will have a Secure Processing Unit to store biometric data and payment information. This all will work with Samsung’s Knox making S9 more secure. Also in an announcement made by Samsung production of a 512GB storage chip is started, and users will be able to see it in S9. But people are suspicious about the claim as they think Samsung can come with a 128GB rather than a 512GB one. As Samsung shipped S8 with 64GB of storage, so a 128GB storage will be a big leap. But with all this there’s good news 3.5mm jack will stay. When we speak about the OS, a beta version based on Oreo is already in testing with all the tweaks and widgets assuming that S9 will be released with the new version in it. Iris scanner will surely be enhanced in Galaxy S9 as the fingerprint scanner in S8 had some issues. Synaptics, smartphone supplier has made it public that they are working on mass production of the new Clear ID in-display fingerprint technology with a “top five OEM.” Meaning it is made specifically for S9. Also, there are rumors that Samsung is testing a feature that Apple scrapped but looking at how things are moving it looks impossible bring both options in S9. So, once there is an official update on it then only we will be able to know. It is assumed that Galaxy S9+ may have a dual camera, but the other variant may not have one. When Galaxy Note 8 was released all thought that it will make its way to S9 and S9+. But it looks like S9 will remain with single camera, whereas S9+ will be getting a camera upgrade like Apple’s new phone. There are reports that state Samsung will be showing a glimpse of its Galaxy S9 at CES this year. But don’t keep much hopes from it as no one is sure abbot it. Samsung might release the device as it does generally in late-winter or early-spring. This is just an idea as nothing yet is announced about the timeframe for the release of the S9. This all information will make your wait easy and will surely make you think about the amazing device Samsung is going to bring for us. Not only this S9 is expected to bring much more than we know about it. These are only the rumors but there is no smoke without fire.